This review is written by David of Retro-Replay.com. Want to write for us? Find out how here. Wizards & Warriors was an wonderful game to me growing up as a tyke . It came out in 1987 and I recall playing it some time in 1988. The musical notes were very catchy and sunk in my head for days at a time. I believe this game passed the test of father time, I have played it on an emulator recently and feel the same way about this title even 20 plus years later. Each world has an exit that is barricaded by a tough as nails knight, and he has a taste for gems. Collect a specific number of gems through out the world you are in, and you can move to the next world. You gain gems by slaughtering enemies, finding them in open areas or inside treasure chests which are usually locked and can be pried open by a key matching the same color as its chest counterpart. The chests contain other items, not just gems. Inside these chests you can find various items to aid you on your quest, such as the boots of levitation, and throwing daggers just to name a couple. 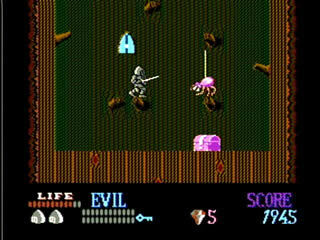 At the end of each level is a monster/guardian, holding a damsel in need of saving. Use your earned skills and powers through out the various worlds in the game to help defeat your evil foes, and save the many women you come into contact with. I had to play this game after supper every night, or in the wee hours of the morning before school until completion. It offered a great sense of accomplishment that to this day does not go unwarranted. Rhys’ View: I owned this game somehow, have no idea how I got hold of it and something tells me I owned this for a long time before playing it. It’s a grower as far as I’m concerned, and I remember it being fairly tricky to die. I also remember that the random ways in which you got items, sometimes getting a strong item earlier in the game made the game a lot easier. I can’t remember ever getting far or completing the game, but I do remember playing it for a good few hours at a time. Top fun & well worth hunting down. 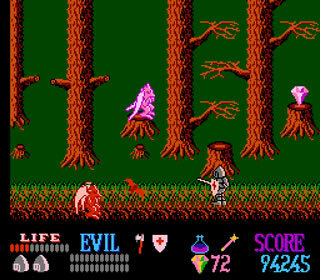 The Wizards & Warriors series was so interesting to me — very distinctive games, not quite like anything else on the NES, and Ironsword (that is, Wizards & Warriors II) was my favorite (even just the title screen music = earworm quality). The odd way of battling, the random items as mentioned in this review for the original game, the jump-around questing… dang, I wanna fire it up again. Good times. since my writing knowledge in English is a little short, i’ll switch to French. J’ai trouvé le jeu Wizards and Warriors chez un prêteur à gage dernièrement. Je me souviens d’avoir joué, enfant, et de n’y avoir rien trouvé de spécial, d’avoir trouvé vraiment étrange la façon dont le protagoniste balance l’épée… Et puis en rejouant, en mettant plus de temps, j’ai compris pourquoi le mot Wizards apparaît dans le titre. Car en plus de l’épée, une série de mode d’attaque et de défense s’ajoute au cours des explorations. Environ 2h15 de gaming pour se rendre à la fin, un niveau de jeu corect, des “continue” à profusion et des boss intéressants. Vraiment du bon temps.